Hear what some of our clients had to say about us! 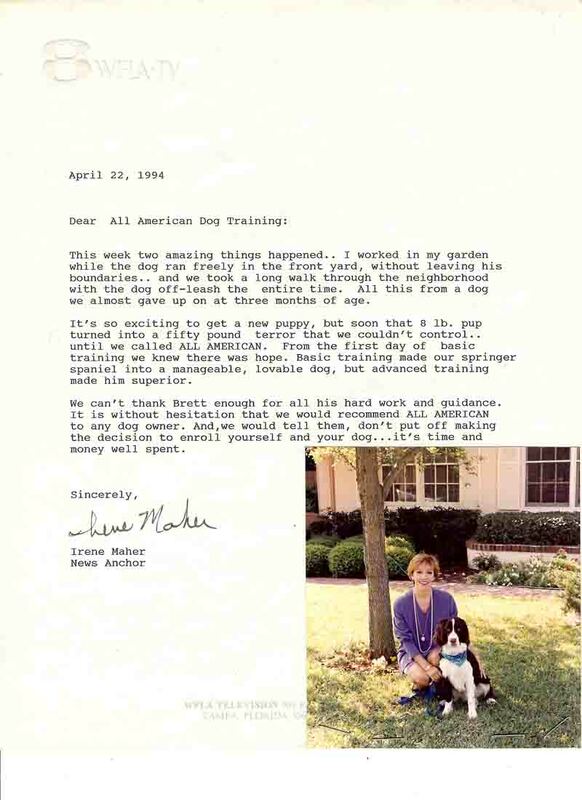 When I began the process of getting a new puppy, a coworker told me about All American Dog Training. 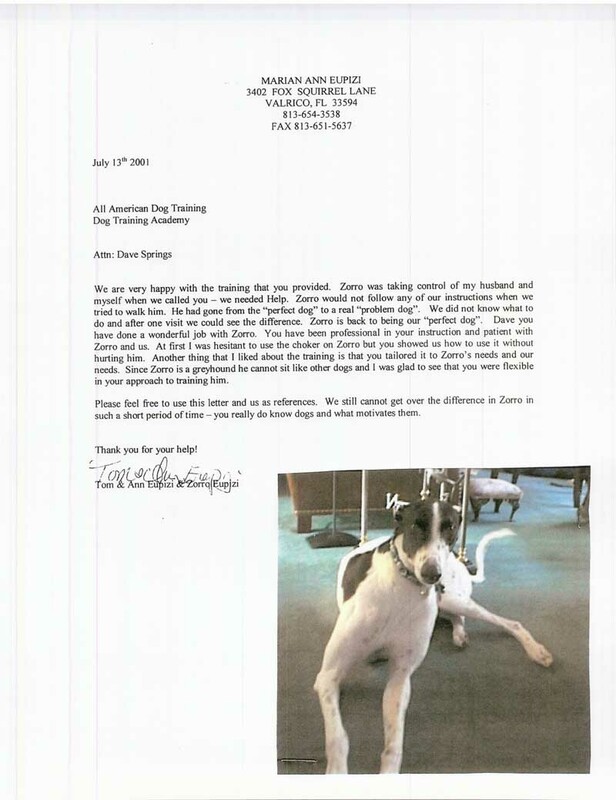 I am so glad I gave them a call and I cannot thank Dave Springs enough for the great job he did training my dog. 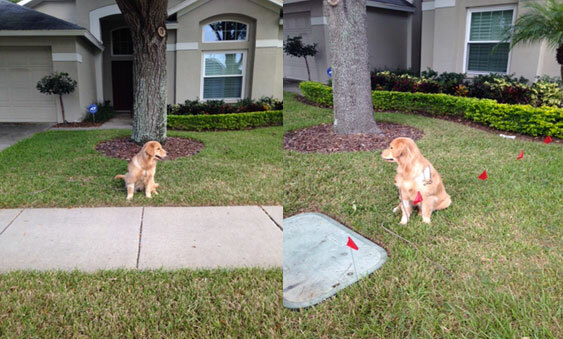 Dave started with the basic sit, stay and heel commands – teaching one command each week. When we got to the command “place” at week five, I did not think there was any way Dave could get my rambunctious four-month-old golden retriever to go to her “place” and stay there until he told her to come. To my surprise, just like all of the other training sessions, within 10 minutes she was getting the concept and by the end of the session, she had the hang of it. Of course, you have to put in the time between the weekly sessions to reinforce the command, but Dave works with you during each training session to make sure you have the hang of it as well. By the end of the training program, she could walk “off leash” and stay within the yard boundaries we had set. Dave was stern when he needed to be but also showed her affection when he told her “good job”. If you put in the time and work between training sessions, you will see results. I know Baylor would not be as well behaved as she is today if it were not for Dave. I can’t thank you enough for the time you spent with Anya. She is a different dog. We thought we were going to have a significant challenge on our hands but your lessons made it happen. I wanted to express my deep appreciation to you. 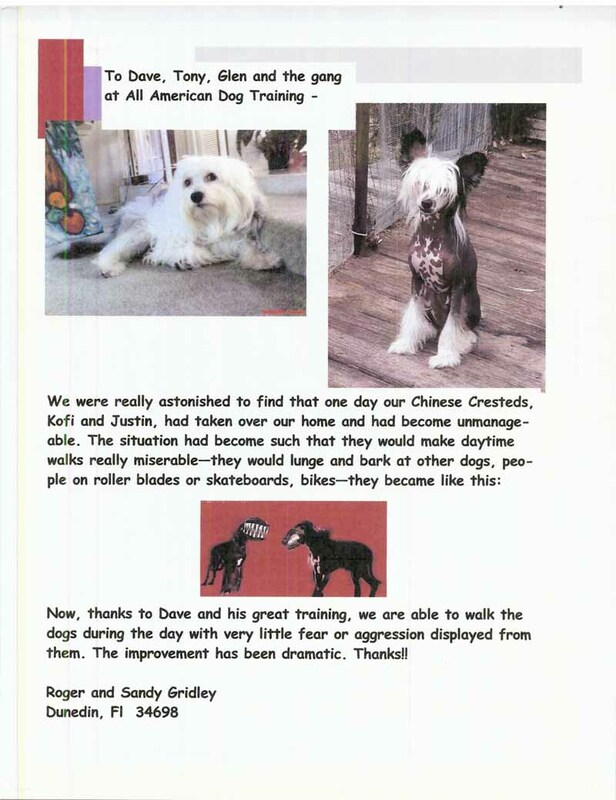 All American Dog Training has been very helpful to my family. Lily came into my life when she was 10 weeks old. I had just lost my Husky to cancer and embraced the thought of a sweet, loving puppy to fill the void. 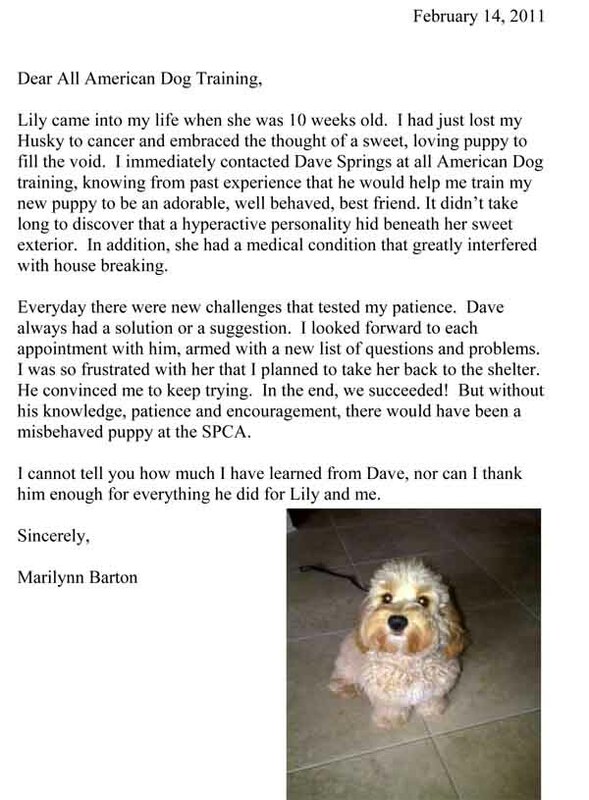 I immediately contacted Dave Springs at all American Dog training knowing from past experience that he would help me train my new puppy to be an adorable, well behaved, best friend. 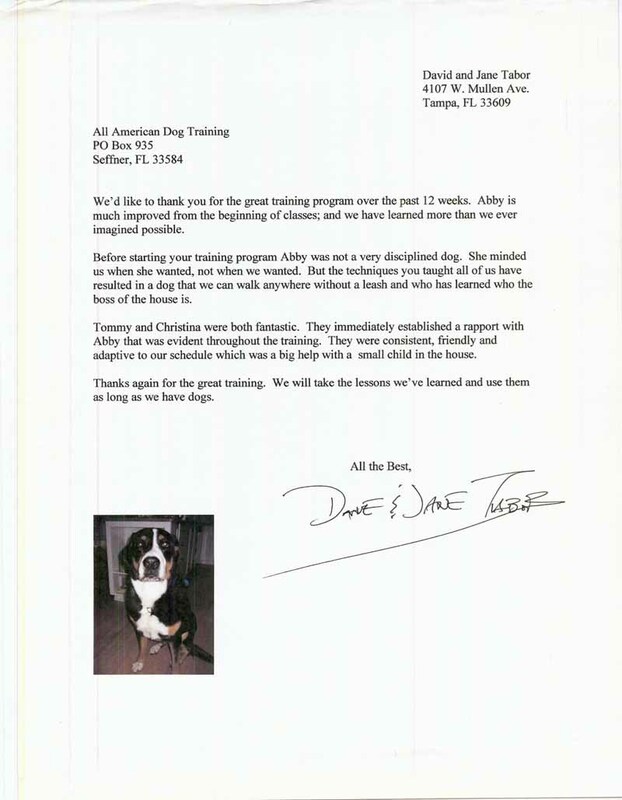 I just wanted to take the time to say “thank you” to Dave and all of AADTA for all you did with our dogs. A little history about our situation: As owners of two very “normal” Jack Russell Terriers, we didn’t think it was possible to ever have peace and quiet in our house. My wife and I had the pleasure of utilizing your services over the past few months. We were fortunate in being assigned Dave Springs for the task. We feel the services were top notch, and we won't hesitate to recommend both the company as well as the trainer. We would like to thank you for the great training program over the past 12 weeks. 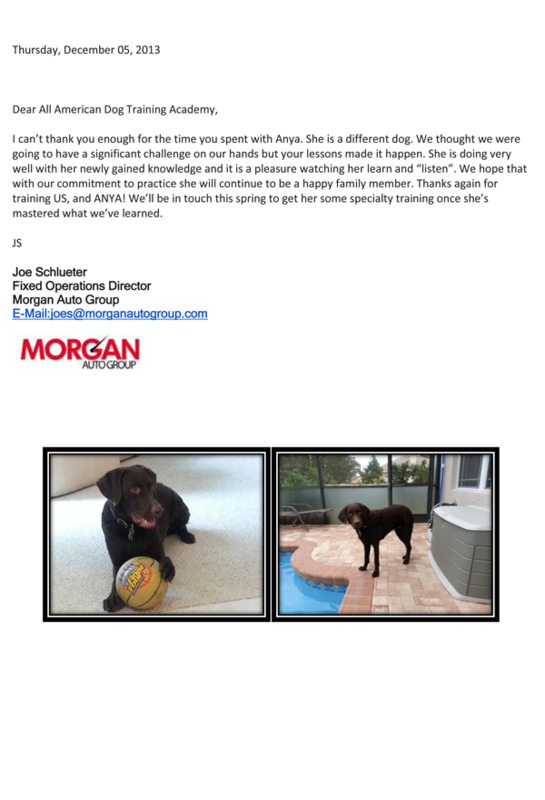 Abby is much improved from the beginning of classes; and we have learned more than we we ever imagined possible. Thanks again for the great training. We will take the lessons we've learned and use them as long as well have dogs. 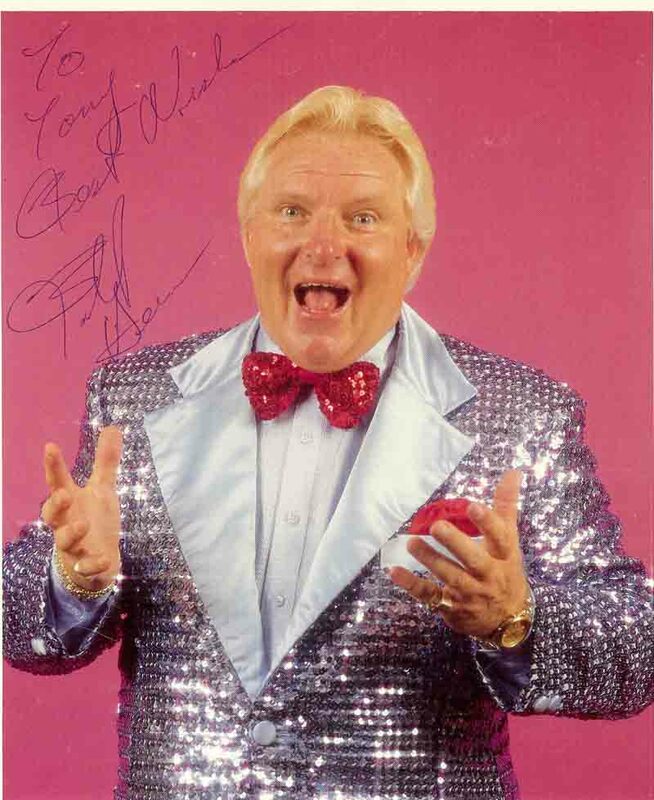 Thank you for turning Smoky's aggressive personality to a personality that is pleasant to be around. Smoky is a citation dog , and we feel confident to be out in public without fear of her biting someone.We know we will have to do our part to keep Smoky's new improved personality, and we are willing to continue the training you have taught us. Now, thanks to Dave and his great training we are able to walk the dogs during the day with very little fear or aggression displayed from them. The improvement has been dramatic. I am a quadriplegic and my goal is to train my dog "Mookie" to function as my service dog. I need Mookie to work with me at home as well as in very public places such as Walmart and Publix. I highly recommend this polite and knowledgeable young man for any dog training or problem correction tasks. 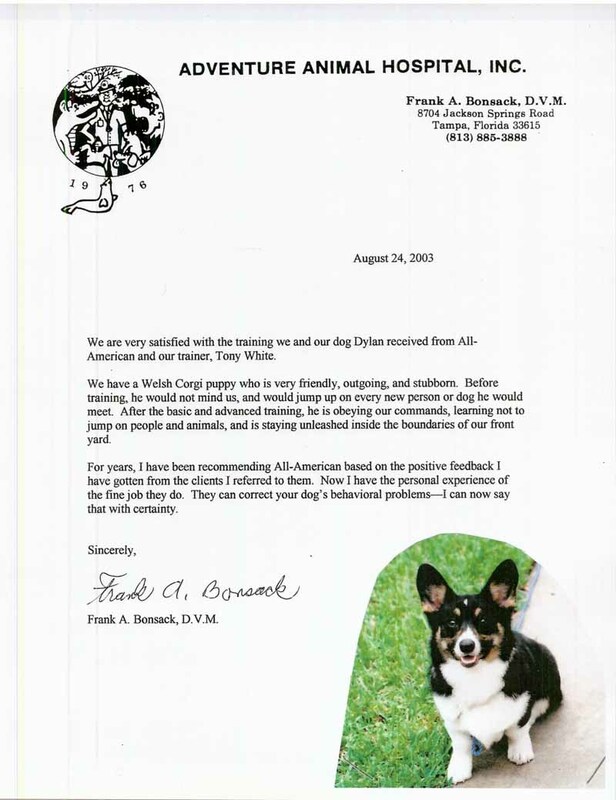 For years, I have been recommending All American Dog Training based on positive feedback I have received from customers I have referred to them. Now I have the personal experience of the fine job they do. They can correct your dog's behavioral problems; I can say that with certainly. 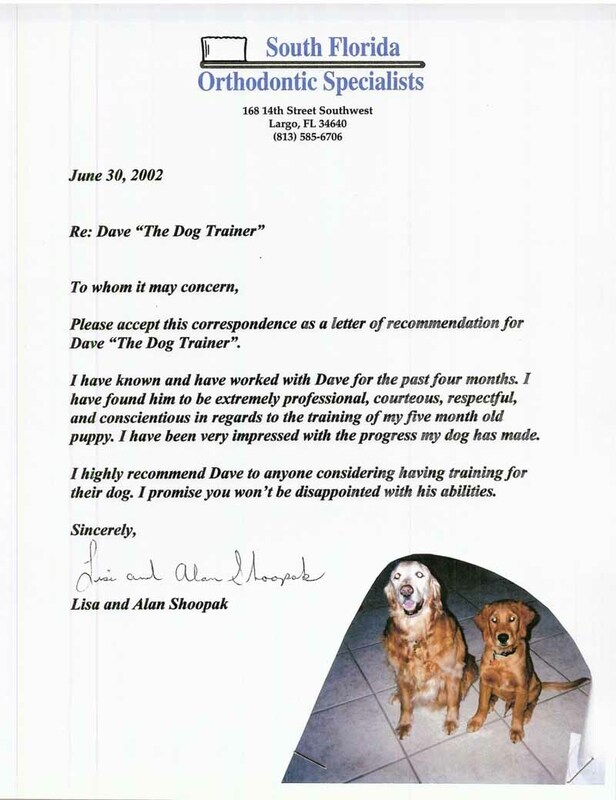 Please accept this correspondence as a letter of recommendation for Dave "The Dog Trainer." I highly recommend Dave to anyone considering having training for their dog. I promise you won't be disappointed with his abilities. We are very happy with the training that Dave provided. Another thing that I liked about the training is that you tailored it to Zorro's needs and our needs. Since Zorro is a Greyhound he cannot sit like other dogs and I was glad to see that you were flexible in your approach to training him. 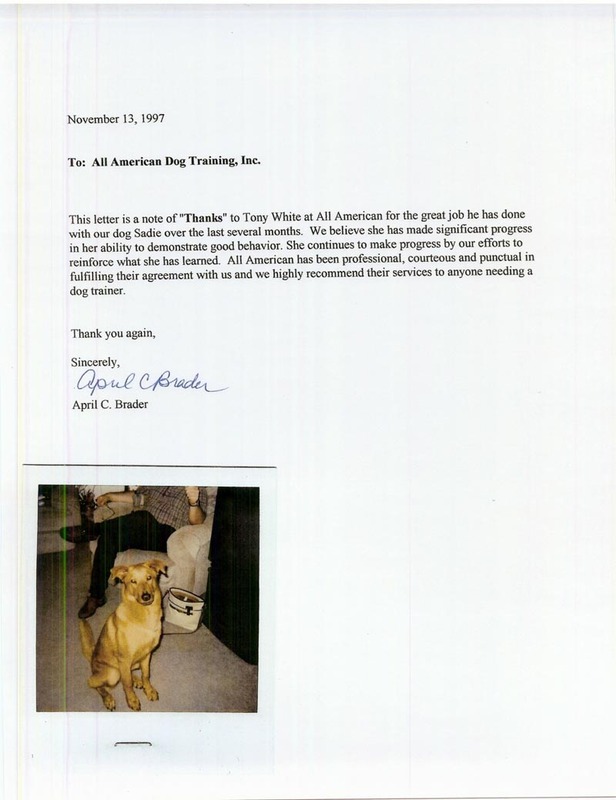 This letter is to recommend the services of All American Dog Training Academy. Without reservations, we would wholeheartedly recommend their services to any dog owner who loves their dog and wants a trustworthy family pet. Tony, here are a few pictures for your collection. 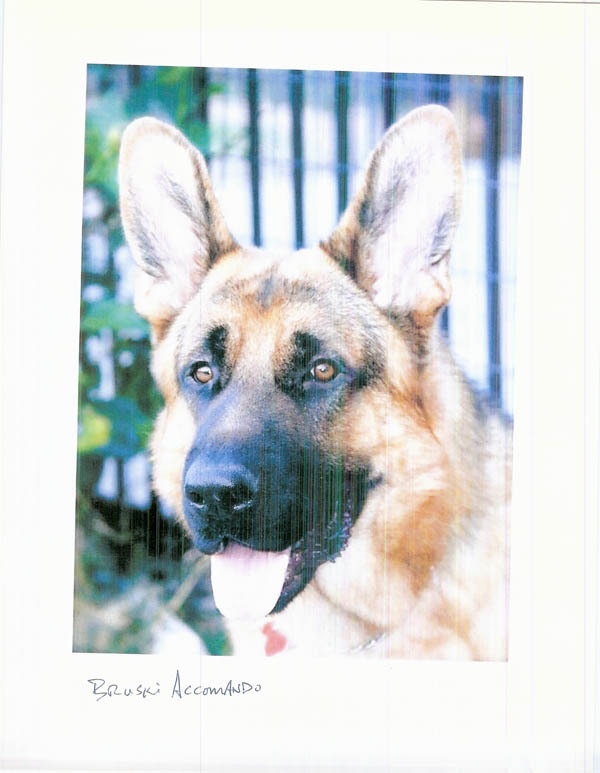 We really enjoyed your training and fine command of the animal, our pride and joy, Max. 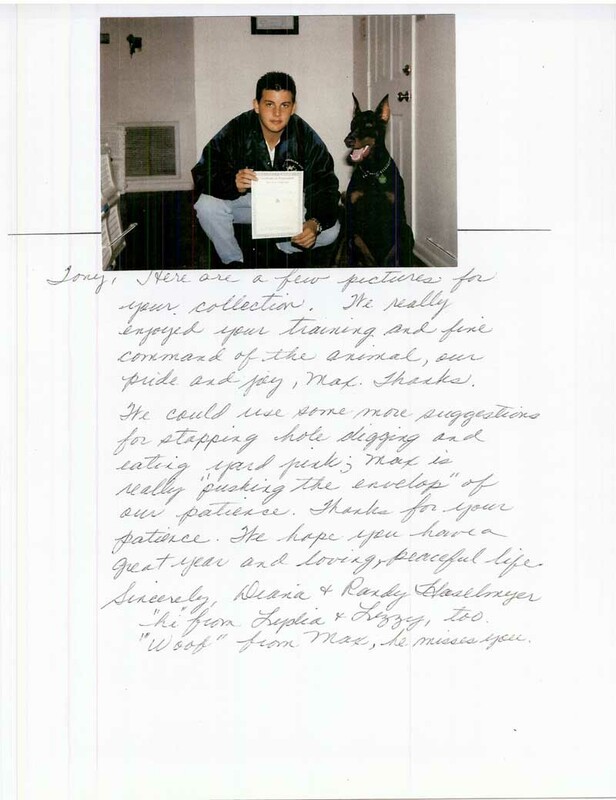 Thank you for the difference your skills have made in taking a fear aggressive pound puppy, and an obstinate one at that, and turning her into an obedient and confident pet. Thank you for all the training that you did with Ruby . She has come along way. She hardly ever has any accidents in the house. She listens well now. 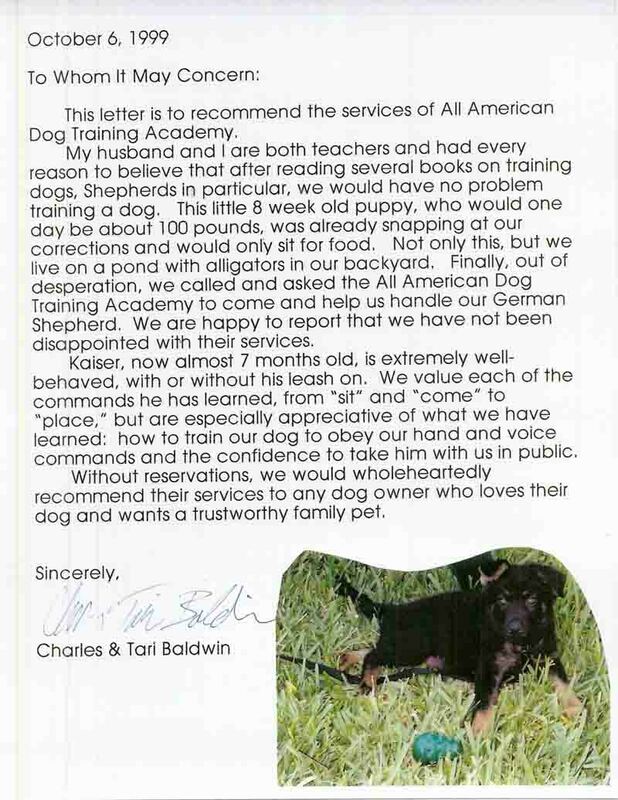 I would highly recommend All American Dog to anyone that wants their dog to have obedience. 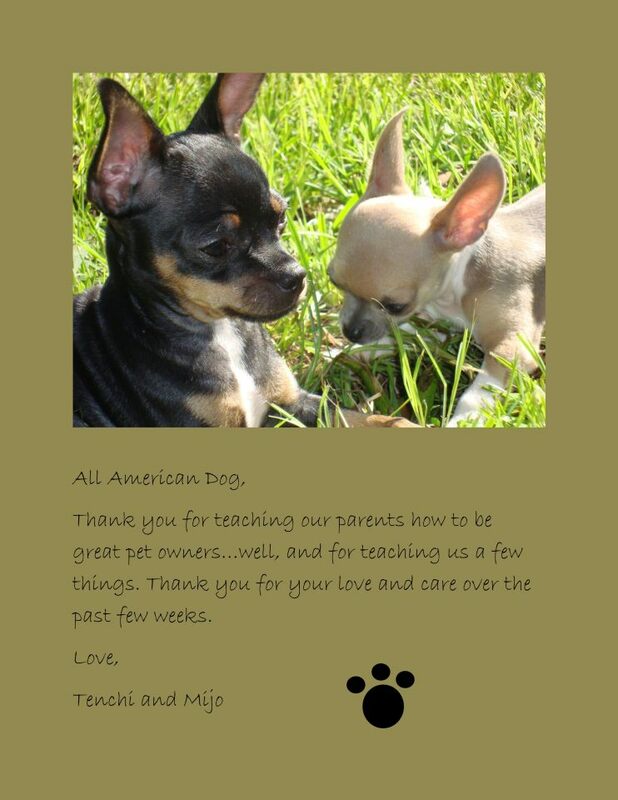 It is without hesitation that we would recommend All American to any dog owner. 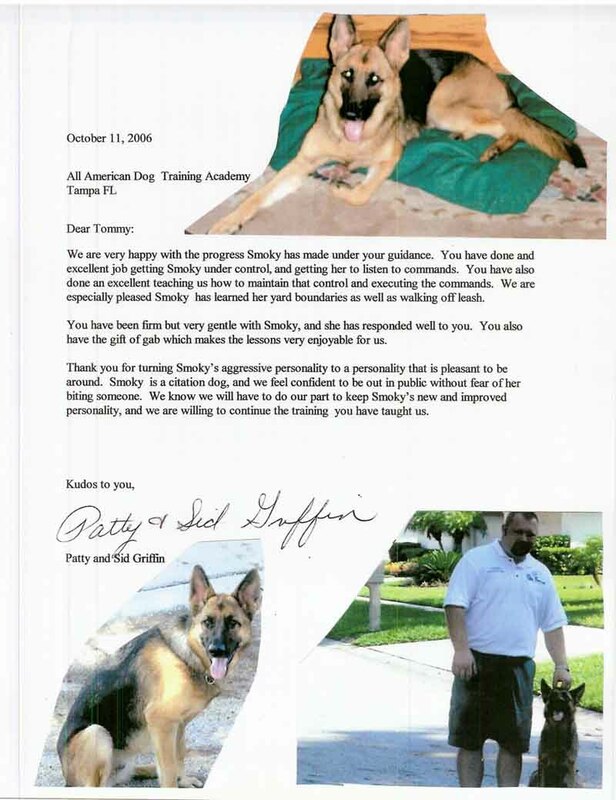 We would tell them don't put off making the decision to enroll yourself and your dog. Its time and money well spent. I wanted to take the this opportunity to express my gratitude for the wonderful job that you did training Zieg. 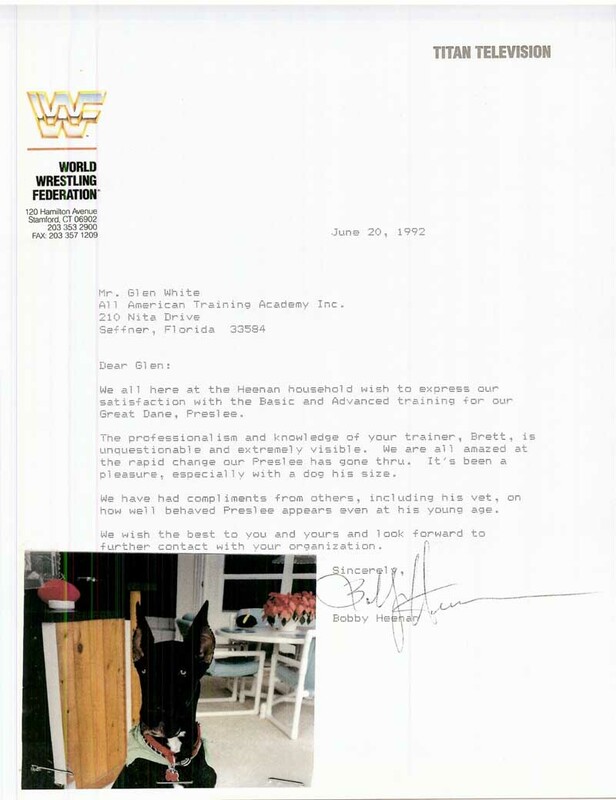 We all here at the Heenan family wish to express our satisfaction with the basic and advanced training for our Great Dane, Preslee. Your compassion and kindness are greatly appreciated and tremendously worthwhile. Because of your help, the deaf Dalmatian, Daisy, is a happier and more secure dog. As a law enforcement agency that must deal with complaints concerning inhumane practices, the Washington Humane society has found All American Dog Training a blessing in the animal training field. Your organization is one of the very few we have no hesitation in recommending to our patrons. 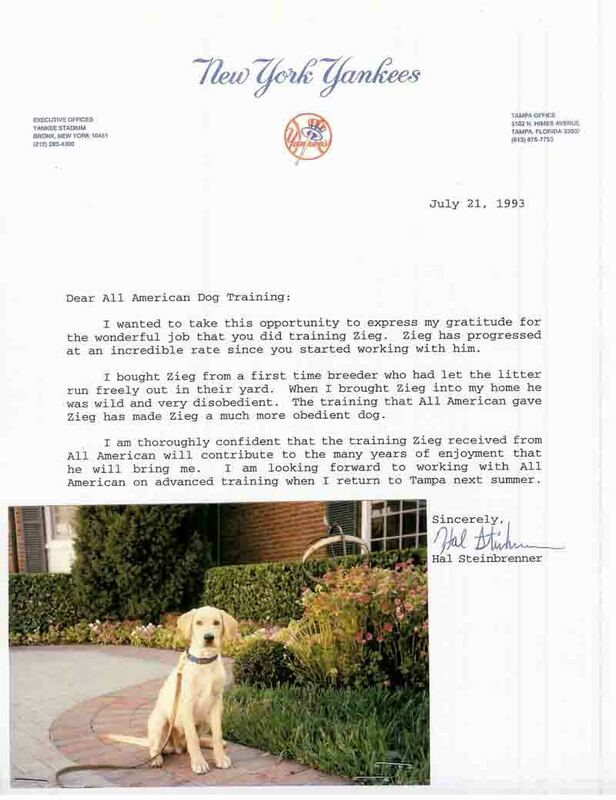 Although Mrs. Kissinger was very pleased with your training of Tyler, and certainly is in favor using humane techniques, I am afraid that her position prohibits her giving endorsements for commercial purposes. 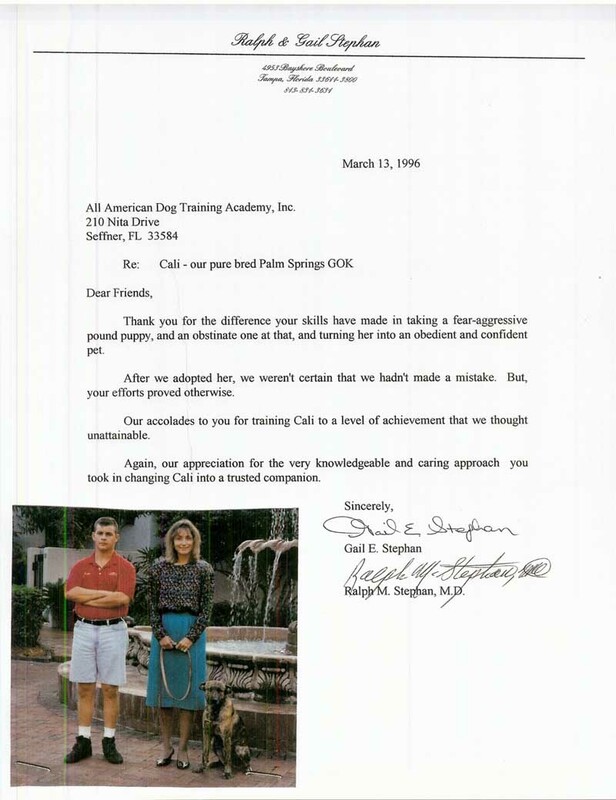 However, I am sure that she will not hesitate to recommend All American Dog Training to her friends on an informal basis. 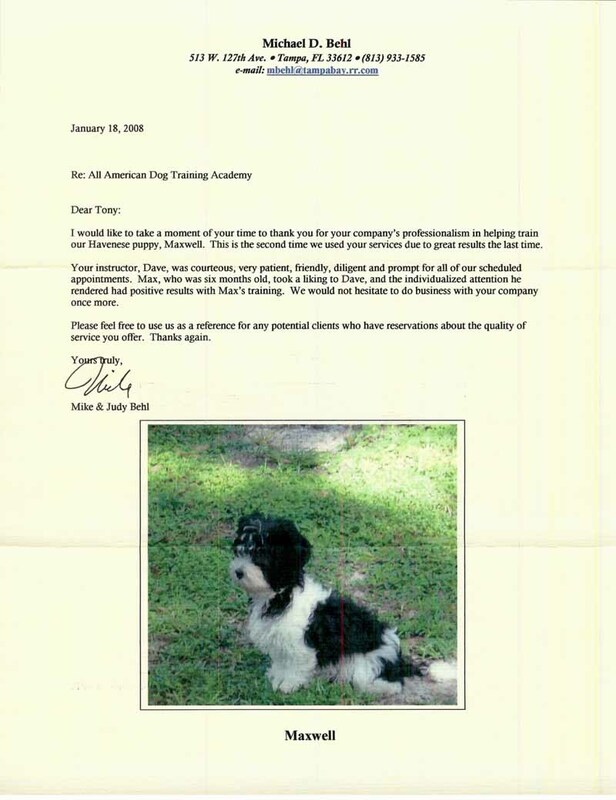 Think you have what it takes to become a part of All American Dog Training Academy training team? We are looking for a few good Men or Women to help with our training schedules. If you think you have what it takes, Check out our Now Hiring page and see the qualifications.